Abstract : We address the problem of constructing appearance-preserving level of details (LoDs) of complex 3D models such as trees. 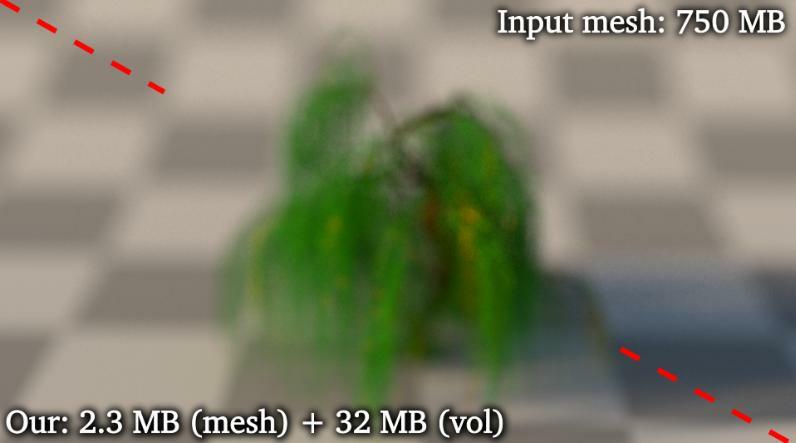 We propose a hybrid method that combines the strengths of mesh and volume representations. Our main idea is to separate macroscopic (i.e. larger than the target spatial resolution) and microscopic (sub-resolution) surfaces at each scale and to treat them differently, because meshes are very efficient at representing macroscopic surfaces while sub-resolution geometry benefits from volumetric approximations. We introduce a new algorithm that detects the macroscopic surfaces of a mesh for a given resolution. We simplify these surfaces with edge collapses and we provide a method for pre-filtering their normal distributions and albedos. To approximate microscopic details, we use a heterogeneous microflake participating medium and we introduce a new artifact-free voxelization algorithm that preserves local occlusion. Thanks to our macroscopic surface analysis, our algorithm is fully automatic and it generates seamless LoDs at arbitrarily coarse resolutions for a wide range of 3D models.